This project has been one of the ongoing ones, that just took a giant leap forward - after some gentle nudging from Peter Lockyer, the builder architect who I worked with. Nothing like a deadline to work to, and the deadline is the 2014 Sustainable House Day - on this weekend. Some more about the progression of the greenhouse can be seen in the Bathroom with a view post. Since moving in there has been many competing priorities on what to do first. The greenhouse kept getting put on the back burner and it was Peter who kept moving me along, beginning with the adding of the flashing on the timber frame back in October 2011. Since then the project stalled until I asked Peter if he was interested in running tours with me for this years Sustainable House Day. "Maybe you should finish off that greenhouse" - um, okay. Wow, no wonder I put it off for so long, it ended up being a BIG job. Timber frames installed and painted, flashing, and louver guides fitted. I'd been tossing up in my mind (for years) weather to just have brick paving and use baths for garden beds or to commit myself to brick wicking 'beds'. 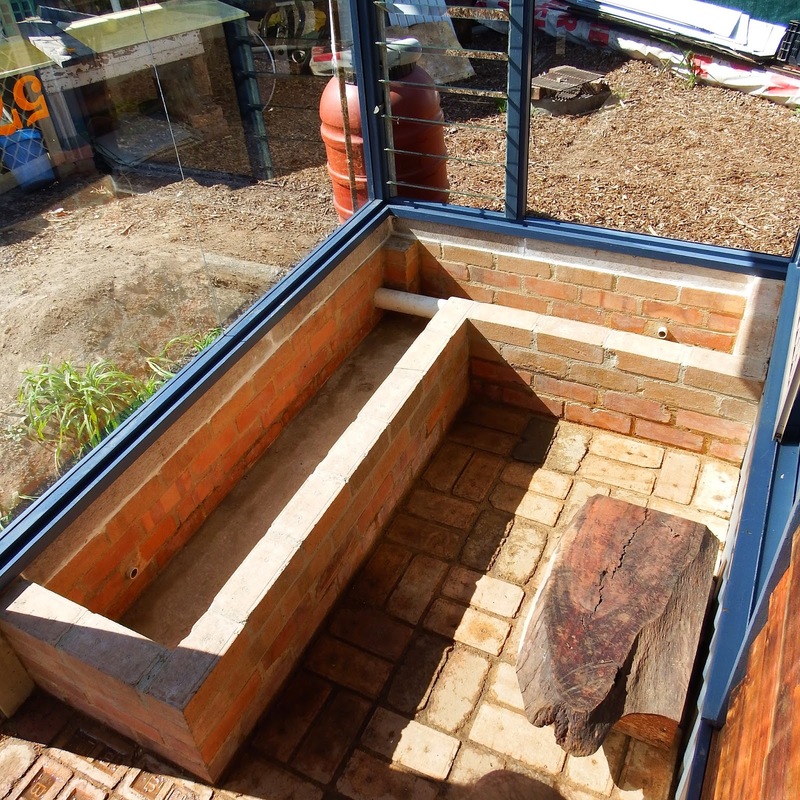 I'd always imagined that below the window would be bricked in and decided to put footings in for that before later deciding to include footings for the edges of the 'bed' too. I figured it would be better to do the job properly, than redo it later. As the 'bed' took shape I started wondering about the possibility of it becoming part of an aquaponics setup, as it's some pretty heavy duty infrastructure and I want to make the most of this space. 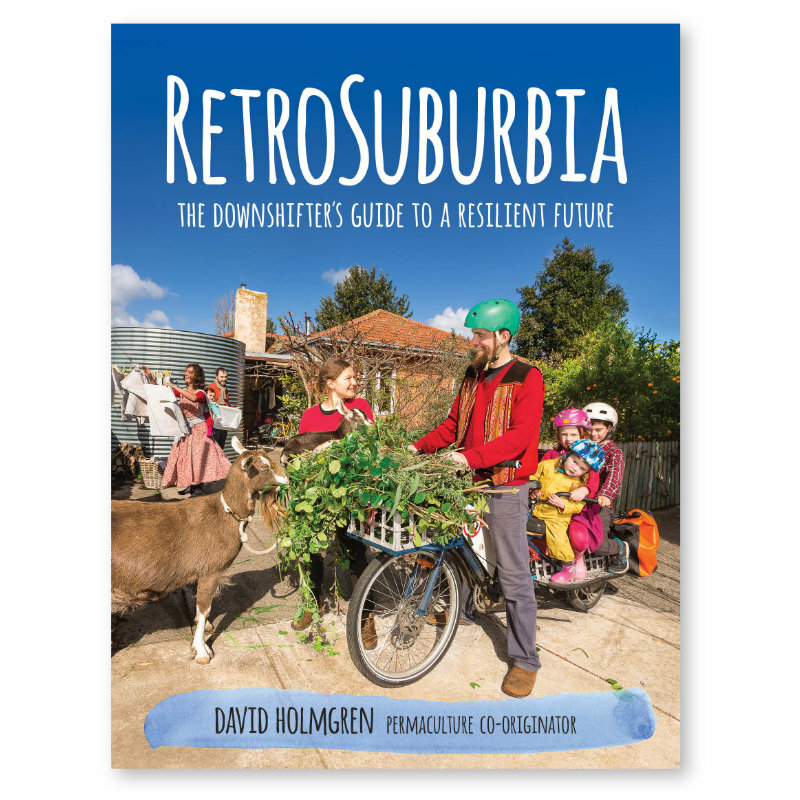 Interestingly, I was contacted by Rob Armstrong of foodqube about running an article about how aquaponics can apply all of the permaculture principles. Some of my concerns about aquaponics were around the amount of plastics and pumps and unsustainable inputs required to set up and maintain an aquaponics system. Rob helped me to see things a bit differently. As the brickwork was installed after the framing, I had an awkward gap between the last layer of bricks and the frame. I resolved this with some left over concrete sheeting that I fitted to the inside, under the flashing, and slapped in concrete on the outside with mortar to fill in the gaps. I also concreted in the base of the 'bed' to contain water for either a wicking bed or aquaponics set up - that may be sealed in the future if required. You may also notice a pipe running through the brickwork - that's the greywater diversion pipe, another delayed project for the future. My trusty mate Dylan came on board to help me out with the glazing. As a professional glazier, amongst many other professions, he often gets access to glass that would usually get thrown out. He had some shop window glass sitting in his shed for many year that he had in mind for my job. We gathered it, cut it and installed it - and then Dylan ran me through the tips and tricks of finishing the job. Of course the framing wasn't square, so the fitting was a real custom job. We used two pieces for the north side, leaving a 2mm gap that was later filled with silicon. 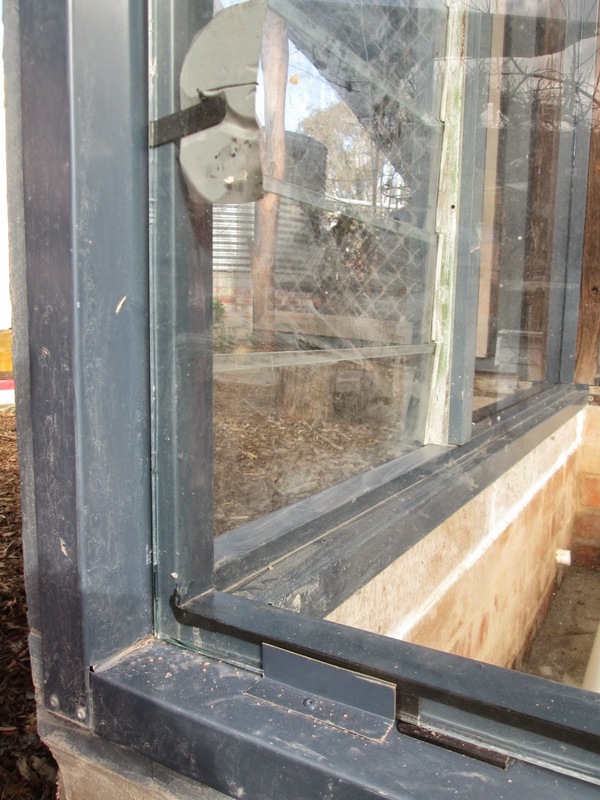 All edges had a 2mm gap between the glass and the flashing and the back of the glass has a 1mm gap against the flashing. This gap was filled with black silicon with excess scraped away with a plastic edge and wiped away with the help of a spray gun filled with a 50/50 (?) mix of metho and water while still fresh. I used 'L' tin flashing as beading, fixing it to the flashing with pop rivets - temporarily at first with small pieces and later with full lengths backed with silicon. Detail of glazing installation - note gap around edges and back using black plastic (removed later), temporary beading to hold in place and black silicon on inside to fix glass. The materials that I had left determined a good part of the cladding. I hate having stuff sitting around, but I love collecting stuff. Use it or lose it I reckon. The green tin, near the small louver winder was recovered from the local demolition. The window allows warm air to enter the kitchen when it's needed. 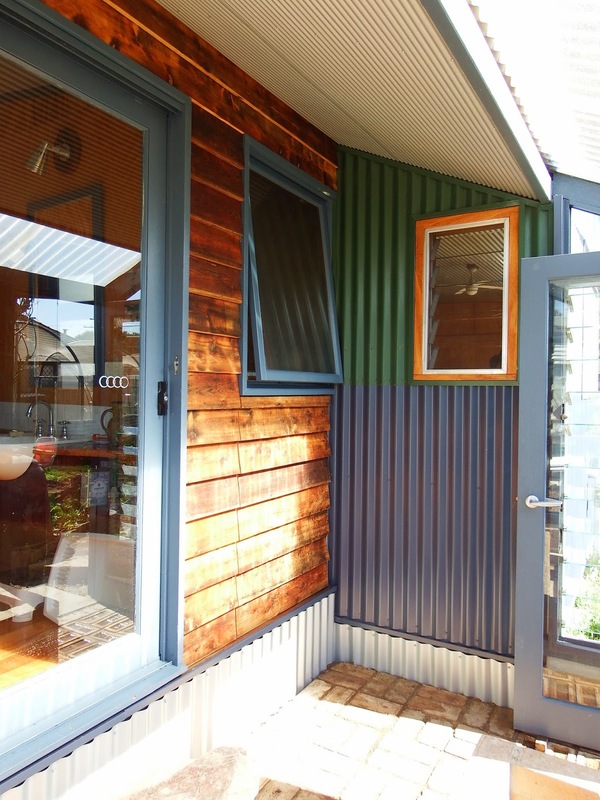 The cladding of the bathroom / toilet wall is a different feel to the rest of the exterior of the house, but I figured that it wasn't really the outside of the house, it's a sort of inside outside space. 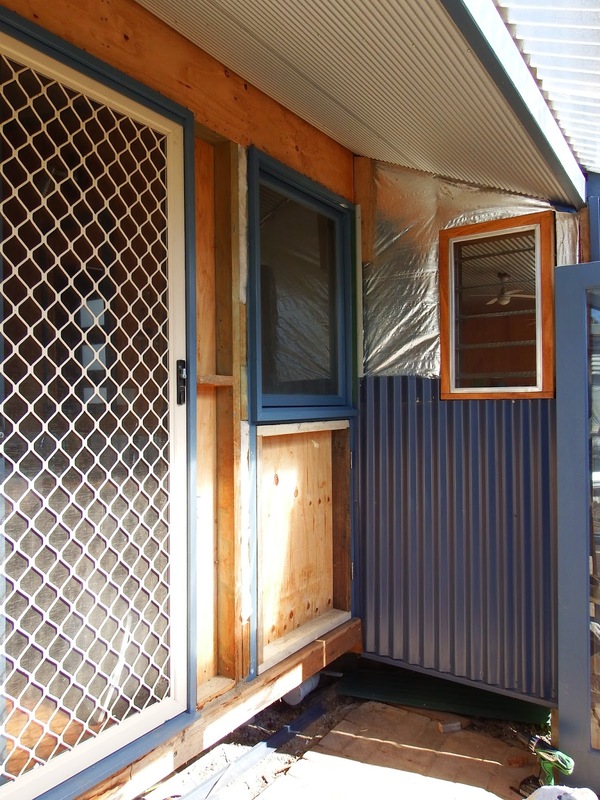 I have used weatherboards outside above the carport door and large northern window, so it does tie in somewhat. Inside, of course, it links with the hallway wall that runs the length of the house. I wanted to block in under the house, to prevent vermin from entering the greenhouse and also to contain as much heat as possible. I managed to glean a very large quantity of corrugated iron from a neighbour recently, some of which was offcuts from a new roof that he had installed - perfect. I helped him out on his renovation for a little bit as an exchange. I also had a couple of garbage bags full of old wool that wasn't good enough for Kunie to spin. Perfect for insulation though, with a bit of left over foil for added insulation and to hold it in place. 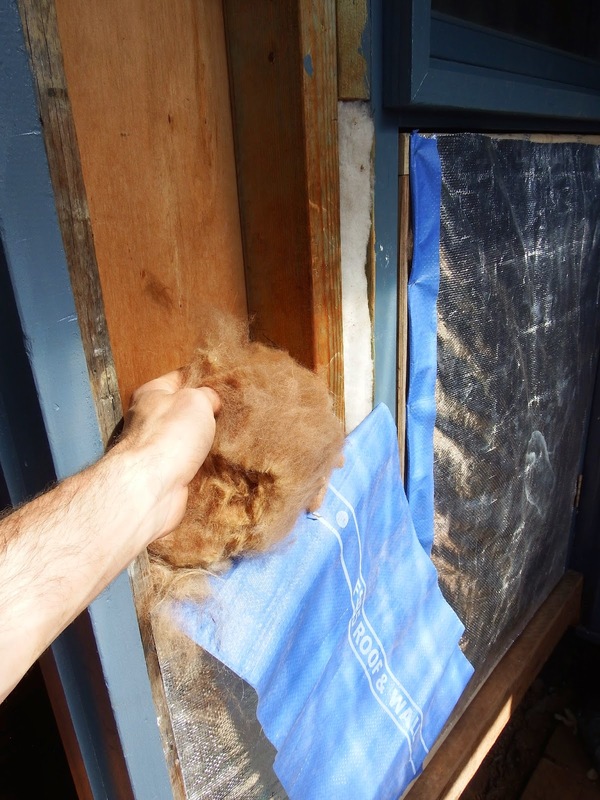 Scrap alpaca and sheep wool used as insulation in wall cavity held in place with reflective foil during installation. 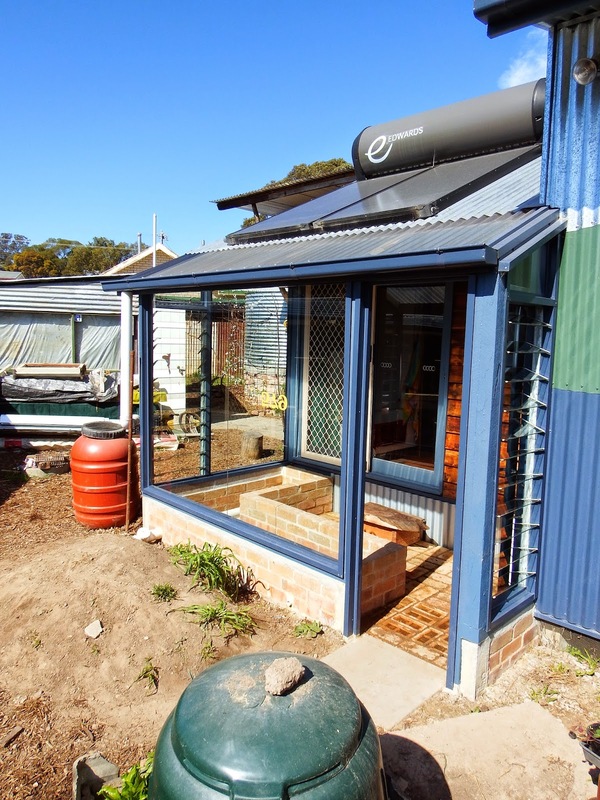 Recycled green tin installed around louver window to kitchen, oiled weatherboards from original house reused for bathroom / toilet wall and tin recovered from a new neighbour used to fill underfloor space. With the addition of a step made with the offcut from the Red Gum slab used for the kitchen bench the room from the room with a view (our bathroom) was complete - well, this stage anyway. The brick mass helps store the heat absorbed during the day, and release it at night. I've certainly noticed a difference inside - the bathroom and toilet don't have that chill factor that they once did. It's also great to open up the sliding door of the bathroom on sunny cool days to help heat up the eastern side of the house, that has no thermal mass. My office is down that end, and it gets bloody cold in winter - any little bit of heat helps. Our blue greenhouse is now ready for the next stage. Wicking bed or Aquaculture, that's the next question. 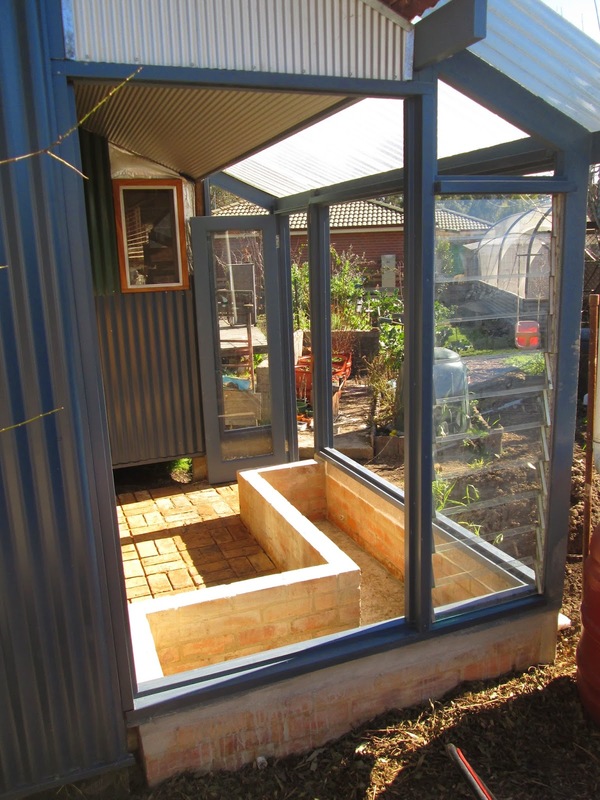 In this build I've also created a door behind the toilet within the greenhouse to access our sawdust toilet system - I'll write more about that later. Probably the first think I want to do is set up a frame so that I can work in multiple layers in the greenhouse. I need a relatively small space for raising seedlings, with the majority of the space for super productive plants or plants out of season. In doing that I need to clarify how to proceed with the aquaponics system. I continued my research last night, mainly on Rob's foodqube site (excellent blog posts there) and the Backyard Aquaponics site, which found a great way to get my head around the possibilities of setting it up. I'm currently thinking a flood and drain system (see video below) might be the way to go, with a custom bed set up above the brickwork, maybe even a double story bed, since I have the space. Will I need to seal the brickwork, or will it hold water without sealing? Water temperature in the greenhouse, and suitability for livestock (is that what you call them)? Are yabbies / silver perch / gold fish a good combo? How much livestock can be comfortably kept in the 450 - 600lt capacity that I have? Will I need to block out sunlight to the water to prevent algae growth? I might see what Rob thinks would be the best way forward, I much prefer to worth with people who know what they are doing rather than make lots of mistakes myself - and trying to find answers in forums can be a complete nightmare, unless you know exactly what you are looking for. 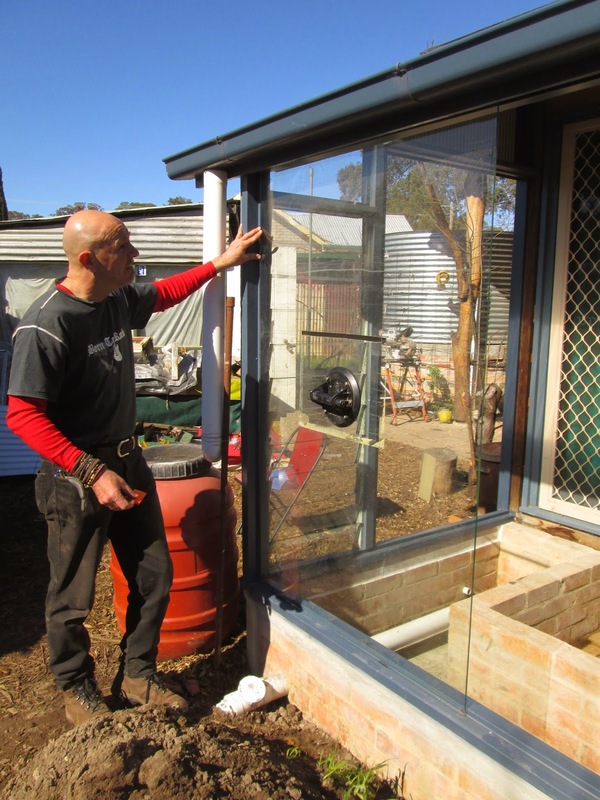 There's also Dave the tank guy, here in Seymour who has been experimenting with aquaponics and I'm keen to see more of what he has been up to. I'm excited ! I dropped in to visit Dave Palmer, from Rural Tanks in the industrial estate in Seymour. He showed me his latest creation, after experimenting with aquaponics for a couple of years. Dave makes old style galvanised iron water tanks, I have two of them here, and he's been creating new product lines with the changing market. He's got garden rings, wicking beds and now tanks design specifically for aquaponics. In this recently made demonstration setup, which is still under construction, he has painted the inside of the tanks with bitumen paint - which he has experimented with. I tasted the water, and there was no bitumen taste. He's also used locally sourced volcanic scroia and had local contacts for local(ish) fish suppliers. A good man to talk to, that's for sure. After the removals of dirt and giving the glass a quick polish, the greenhouse really looks wonderful! Can't wait to see it when the plants are put in!